In light of many meanings being given to Action Research (Craig 2009; Schmuck 1997, 2006), this think-piece positions our Cycles and Epicycles for Action Research framework (Part 1) in relation to three sources of inspiration: Participatory Action Research; Strategic Participatory Planning of the Institute of Cultural Affairs; and the Highlander Center. Our emphasis on constituency building is informed and inspired by Participatory Action Research (PAR), in which social scientists shape their inquiries through on-going work with and empowerment of the people most affected by some aspect of economic or social change. Greenwood and Levin (1998, 173-185) review various approaches to PAR (see also Park et al. 1993; Selener 1993; Denzin and Lincoln 2005; Kemmis and McTaggart 2005; Chevalier and Buckles 2013). The power of participation is better conveyed, however, by accounts of the struggles of local peoples to influence science and politics, e.g., Adams (1975), Gibbs (1982), Brown (2007). PAR or its cognates are widely promoted in rural development in poor areas of the world, from which cases are often drawn to illustrate the rise of citizen participation and of new institutions of civil society (Burbidge 1997). The following example of PAR in agroforestry is drawn from Taylor (2005, 204ff). In the mid-1980s CARE, an international aid and development organization, decided to respond to the excessive removal of trees in agricultural areas in western Kenya. They embarked on a project to establish an extension system that would promote and provide support for tree planting by farmers on their holdings. CARE sought to overcome the shortcomings of previous agroforestry projects in the Sahelian region of Africa, which had largely failed—one estimate of the average cost those projects had incurred for each surviving tree was $500. At the same time, CARE wanted a research component built in to analyze systems of farm production, not only of crops, but also of things necessary to basic household needs, such as for energy, shelter, and water. The research aimed to tease out the trade-offs, constraints and benefits in growing trees within those systems (Vonk 1987). The leaders of this development project, agroforesters Remko Vonk and Louise Buck, identified that one reason for previous failures was that the community-based nurseries and plantations of previous projects had left the beneficiaries of the tree products and timber ill-defined (Vonk 1987). Many of the local participants saw the tree planting as someone else's project, and thought the benefits would not likely come their way. Vonk and Buck reasoned that if trees were planted on individual farms, the ownership would be clearer; the local Kenyans implementing the project would also be the ones reaping the benefits. Moreover, the project leaders aimed to facilitate local participation in the design and evaluation stages of the project. In pursuing this, they drew upon their experience in a pilot project and upon the experience of others in previous health care extension projects. This combination of local and outside influence characterized the project as it developed. First, CARE only entered only the farming communities that invited them. Initial interviews were conducted to learn about the existing use of trees on and off the farms: Which trees are being used; which had been used; which could be used? What are the reasons for not planting trees? Much of the interviewing was conducted by extension workers who CARE directors trained not to transmit information, but instead to “Respect, Encourage, Ask, and Listen.” In response to information emerging from the interviews, CARE's preliminary plan of planting four species was modified to allow for selections from a menu of forty-eight species. The techniques of cultivation that the researchers adopted, using indigenous systems as a starting point, were understandable to the farmers and could be managed by them within their labor and other seasonal constraints. In turn, the extension agents' connection with farmers helped them plan, monitor, collect data on, and analyze the different tree-planting arrangements. The resulting agroforestry practices and results differed markedly from those of previous systems and from the approaches of CARE's agroforestry specialists, which had been on trees that would directly serve agriculture, for example, by fixing nitrogen and making it available in the soil. The case of Markhamia platyclayx is illustrative. This species, virtually unmentioned in the agroforestry literature, was the most commonly found species in cropland in the district. The tree did not enhance crop growth, but, as interviews with the farmers revealed, M. platyclayx grew quickly and so was used to demarcate family compounds and plots. Reduction in crop production because of shading and root competition could be minimized if the trees were pruned regularly. The leaves became a source of mulch and compost, and scattered trees contributed to soil conservation and had a windbreak effect that protected the crops in the fields. The trees could be cut for poles when cash income was needed. They could be used to provide timber or shade. Finally, the leaves were used in preparing food and in medicines. CARE research confirmed that farmers generally knew how to manage the species well for these different uses. At the same time, CARE was able to help the farmers by contributing research results on the optimal time for harvesting of trees to be used for poles and on possible causes of seedling death. In general, the trees that farmers favored turned out to have the following characteristics: They tended to require low management. They were inter-cropped with crops or even interspersed throughout the fields; they were not only planted as hedgerows. Their products, such as firewood and poles for building, sometimes compensated for the negative impact they had on the yields of adjacent crops. Over and above these characteristics, other factors influencing use of different tree species on particular farms or more generally included: the history of different farms, in particular, where family compounds had been abandoned leaving its trace in nutrients from feces and ashes, and how land had been subdivided among sons; the different needs of men and women; and the need for firewood in areas close to Lake Victoria in order to smoke or fry Nile perch (a species that, unlike the fish it has displaced since being introduced to the Lake in the 1950s, is too oily to be sun-dried). CARE's project involved researchers' collaboration not only with farmers, but also with community groups. For example, researchers worked with schools to establish seedling nurseries. When termite removal of seeds became a problem, the project leaders insisted that pesticides not be used near schoolchildren and sought non-toxic solutions. Some control schemes suggested by the community members failed, but success was eventually achieved following some farmers' recommendation that seeds be surrounded with ashes. Again, in the spirit of collaboration, one CARE official's innovation of using plastic to avoid dampening the ashes when watering the crops reduced the number of times the ashes had to be reapplied. This combination of local and outside influence occurred in many other varying ways. The extension workers CARE trained were young adults from the area, who would continue to live and work in the area after CARE withdrew. Yet, CARE deliberately chose to train women and men in equal numbers, which would not have occurred if selection had been left to the unequal gender norms of the community. CARE allowed local practices to form the focus of their research, but the CARE agroforesters also made observations and conducted trials to relate seedling survival, growth rates, nutrient contributions, and cash values of products of different species to the soils, planting densities, and pruning and harvesting practices, and so on. The results of these investigations informed the advice they gave to the local farmers and to agroforesters in other areas of the Sahelian region. Participation in rural development projects is not always invoked with the sincerity or the success evident in the CARE project. Indeed, the mandate for participation can be wielded in disempowering ways by State or International agencies (Agrawal 2001; Ribot 1999; see also Peters 1996 for a review of the politics of participation and participation rhetoric). Nevertheless, in industrialized countries as well as in poor rural regions environmental planning and management increasingly builds in stakeholder collaboration, that is, explicit procedures for participation of representatives of community groups, government agencies, corporations, and private property owners. Notwithstanding any initial impressions to the contrary, everyone has insight (wisdom) and we need everyone's insight for the wisest result. There is insight in every response. There are no wrong answers. We know more than we are, at first, prepared or able to acknowledge. When we are heard, we can better hear others and hear ourselves. This causes us to examine decisions made in advance about what the other people are like, what they are and are not capable of. The step-by-step workshop process thus aims to keep us listening actively to each other, foster mutual respect, and elicit more of our insight. Our initial conclusions may change, so we need to be open for surprises. What we come out with is very likely to be larger and more durable than what any one person came in with; the more so, the more voices that are brought out by the process. In particular, we will be engaged in carrying out and carrying on the plans we develop. ICA's techniques have been developed through several decades of “facilitating a culture of participation” in community and institutional development. Their work anticipated and now exemplifies the post-Cold War emphasis on a vigorous civil society, that is, of institutions between the individual and, on one hand, the state and, on the other hand, the large corporation (Burbidge 1997). ICA planning workshops involve a neutral facilitator leading participants through four phases—practical vision, underlying obstacles, strategic directions, and action plans (Stanfield 2002). These mirror and make use of the “objective, reflective, interpretive, decisional” steps of shorter ICA “Focused Conversations” (Stanfield 1997). The goal of ICA workshops is to elicit participation in a way that brings insights to the surface and ensures the full range of participants are invested in collaborating to bring the resulting plans or actions to fruition [see principles above and Stanfield 2002, especially his chart of old and new styles of social relations, p. xviii]. Such investment was evident, for example, after a community-wide planning process in the West Nipissing region of Ontario, 300 kilometers north of Toronto. In 1992, when the regional Economic Development Corporation (EDC) enlisted ICA to facilitate the process, industry closings had increased the traditionally high unemployment to crisis levels. As well as desiring specific plans, the EDC sought significant involvement of community residents. Twenty meetings with over 400 participants moved through the first three phases—vision, obstacles, and directions. The results were synthesized by a steering committee into common statements of the vision (see figure below), challenges, and strategic directions. A day-long workshop attended by 150 community residents was then held to identify specific projects and action plans, and to engage various groups in carrying out projects relevant to them. A follow-up evaluation five years later found that they could not simply check off plans that had been realized. The initial projects had spawned many others; indeed, the EDC had been able to shift from the role of initiating projects to that of supporting them. It made more sense, therefore, to assemble the accomplishments under the headings of the original vision and strategy documents. Over 150 specific developments were cited, which demonstrated a stronger and more diversified economic base, and a diminished dependence on provincial and national government social welfare programs. Equally importantly, the community now saw itself as responsible for these initiatives and developments, eclipsing the initial catalytic role of the EDC-ICA planning process. Still, the EDC appreciated the importance of that process and initiated a new round of facilitated community planning in 1999 (West Nipissing Economic Development Corporation 1993, 1999). Another notable organization in the area of participation, collaboration, constituency-building is the Highlander Center, in Tennessee, which has “serve[d] as a catalyst for grassroots organizing and movement building in Appalachia and the South” since the 1930s. The words of Myles Horton (1905-1990) below (as well as those at the start of the fifth section of the think-piece—Journeying to Develop Critical Thinking) convey the philosophy that “answers to the problems facing society lie in the experiences of ordinary people” (HERC, n.d.), a philosophy that guides the popular education, participatory research, and cultural work that Highlander facilitates. Myles Horton (in a 1983 interview with Bill Moyers) recounts his response to a priest who, frustrated at his own attempts to implement the Highlander approach in a labor school back in the early CIO days, tried to get at the problem by learning what books that had influenced Horton's life the most. “I can tell you, but it won't help you because like all people I got my own track of development; my own background is part of it. OK. There's the New Testament; there's the Old Testament. In the New Testament you learn about love. You can't be a revolutionary, you can't want to change society unless you love people—there's no point in it. OK, so you love people; that's right out of the bible. Adams, F. with M. Horton (1975). Unearthing Seeds of Fire: The Idea of Highlander. Winston-Salem, NC: John F. Blair. Agrawal, A. (2001). “State formation in community spaces? : The Forest Councils of Kumaon.” Journal of Asian Studies 60(1): 1-32. Borchers, J. and C. Maser (2001). Understanding Constraints in Sustainable Development. Chelsea, MI: Lewis. Brown, P. (2007). Toxic exposures : contested illnesses and the environmental health movement. New York: Columbia University Press. Burbidge, J., Ed. (1997). Beyond Prince and Merchant: Citizen Participation and the Rise of Civil Society. New York: Pact Publications. Calhoun, E. F. (1994). How to Use Action Research in the Self-Renewing School. Alexandria, VA: ASCD. Chevalier, J. M. and Buckles, D. J. (2013). Participatory action research: Theory and methods for engaged inquiry. Oxford: Routledge. Craig, D. V. (2009). Action Research Essentials. San Francisco: Jossey-Bass. Greenwood, D. J. and M. Levin (1998). Introduction To Action Research: Social Research For Social Change. Thousand Oaks, CA: Sage. Gibbs, L. M. (1982). Love Canal: My Story. Albany: State University of New York Press. Highlander Research and Education Center (n.d.), http:// www.highlandercenter.org/about.asp (viewed 30 Nov 11). Holman, P. and T. Devane, Eds. (1999). The Change Handbook: Group Methods for Shaping the Future. San Francisco: Berrett-Koehler. Institute of Cultural Affairs, http://ica-associates.ca/ (viewed 30 Nov 11). Kemmis, S. and R. McTaggart (2005). “Participatory Action Research: Communicative Action and the Public Sphere.” Pp. 559-603 in The Sage Handbook of Qualitative Research, eds. N. K. Denzin and Y. S. Lincoln. Thousand Oaks, CA: Sage. Park, P., M. Brydon-Miller, et al. (1993). Voices of Change: Participatory Research in the United States and Canada. Westport, CT: Bergin & Garvey. Peters, P. (1996). “Who's local here? The politics of participation in development.” Cultural Survival Quarterly 20(3): 22-60. Ribot, J. C. (1999). “Decentralisation, participation and accountability in Sahelian forestry: Legal instruments of political-administrative control.” Africa 69(1): 23-65. Scharmer, O. (2009). Theory U: Leading from the Future as It Emerges. San Francisco: Berrett-Koehler Publishers. Schmuck, R. (1997 or 2006). Practical Action Research for Change. Arlington Heights, IL: Skylight. Schuman, S. (ed.) (2006). Creating a Culture of Collaboration: The International Association of Facilitators Handbook. San Francisco, Jossey-Bass. Selener, D. (1997). Participatory Action Research and Social Change. Ithaca, NY: Cornell University Press. Senge, P., A. Kleiner, C. Roberts, R. Ross, B. Smith (1994). The Fifth Discipline Fieldbook. New York: Currency. Stanfield, B. (ed.) (1997). The Art of Focused Conversation. Toronto: Canadian Institute of Cultural Affairs. Stanfield, B. (2002). The Workshop Book: From Individual Creativity to Group Action. Toronto: Canadian Institute of Cultural Affairs. Taylor, P. (2005). Unruly Complexity: Ecology, Interpretation, Engagement. Chicago: University of Chicago Press. Vonk, R. (1987). “Indigenous agroforestry systems: A case study from the CARE-Kenya agroforestry extension program, part I & II.” Papers delivered to the Social Forestry Program at the University of California, Berkeley, 21 & 22 September. 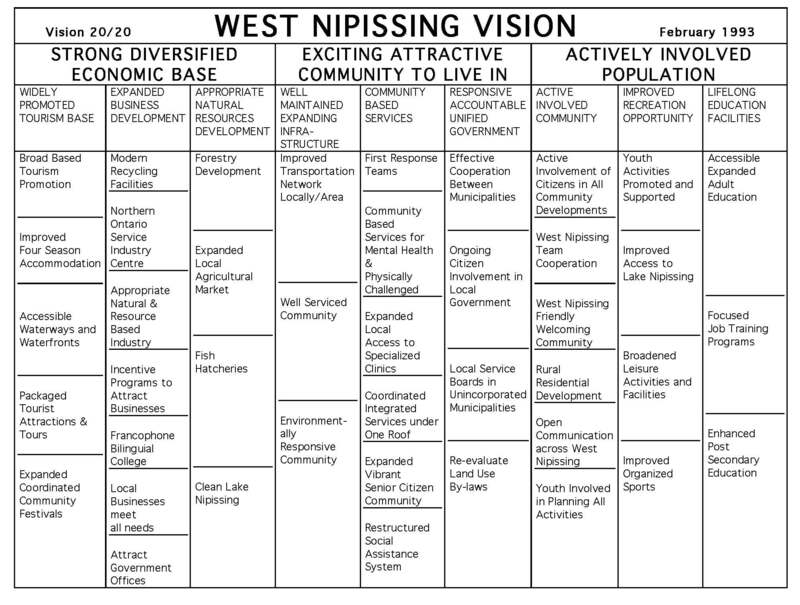 West Nipissing Economic Development Corporation (1993). “Vision 20/20: Shaping our futures together, Executive Summary.” (April 1993). West Nipissing Economic Development Corporation (1999). “Vision 2000 Plus, Executive Summary.” (June 1999).